Flanders claimed the invention of the art of bobbin-lace making. Flanders bases hers chiefly on the existence of the altar-piece in the Church of S. Gomar at Lierre, attributed to Quentin Matsys (1460-1529), in which is represented a girl making lace on a pillow which she holds on her knees. This is said to have been painted in 1495, and on the face of it the picture seems to provide a strong piece of evidence in support of the Flemish claim. But many possessing an expert knowledge of the Old Masters consider the attribution entirely wrong, and assign the work to Jean Matsys, son of Quentin, who painted considerably later than 1495, but very much in the style of his father. From Venice The art of making lace came by way of the thriving port of Antwerp to the industrious and beauty-loving Flanders, where the seed fell on most fertile soil. Flanders possesed a multitude of workers already skilled in an allied art, that of weaving, and the nec­essary lace material in her valley of the Lys, the finest flax region of the world. 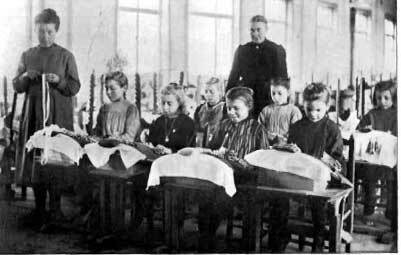 Valenciennes, Lille, Malines, Ghent, Bruges, turned to lace-making with a veritable passion; it spread throughout wide districts of what are now Northern France and Belgium. It is indisputable that, reversing the order of develop­ment as it occurred in Italy, lace made with bobbins on the pillow preceded needle-point in the Nether­lands. Cut-work was produced in Flanders as early as the time of Queen Elizabeth, who was a regular buyer of it. Belgium was the place of choice for Needle Lace for two hundreds years.